THE THRILL OF COLD STEEL! THE ROMANCE OF WARM LIPS! THE EXCITEMENT OF BLAZING ADVENTURE! Following the defeat of Napoleon, France was in a state of unrest. Many of the Royalists who had fled to England returned to exact vengeance for their real and fancied wrongs. 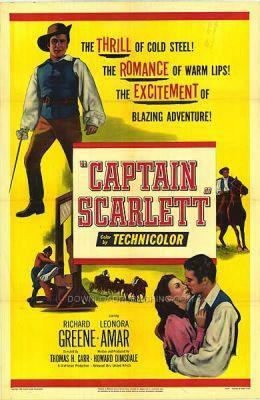 Captain Scarlett arrives back in France and discovers that his land and titles have been taken over by a crooked nobleman. He saves a princess and teaches her to sword fight and teams up with another man who has also lost his land and together they try to get their Lands and Titles back.